Post harvest biology and technology of citrus fruits is gaining importance as the therapeutic value of citrus fruits is realized and supported by the increase in health awareness among the general public. This book is the most comprehensive reference on citrus fruit biology, biotechnology and quality. Basic and applied scientific information is interwoven to serve the researcher, marketer, scientist, nutritionist, or dietician. With discussions of fruit morphology, anatomy, physiology and biochemistry and chapters on growth phases, maturity standards, grades and physical and mechanical characteristics of citrus trees, this book provides the foundation for understanding growth, harvest and post harvest aspects of these important plants. Insect-pests and diseases, irrigation, nutrition and rootstocks are also addressed. Provides practical tips for post harvest management. 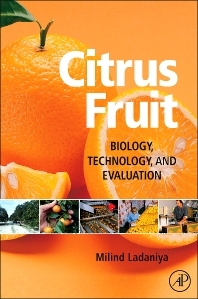 Includes all aspects of citrus fruit biology, technology and quality evaluation.